Did anyone notice that their political meeting was held in a church? I have received campaign material for Terry Gonser and Jeaneane Landers addressed to my husband and I personally from people we do not know. Are they accessing township records for this information? Roger Schmidt is also on the “ticket” created by Ann Marie Rogers. Strange to run for a commission and then advocate for it to be de-funded. 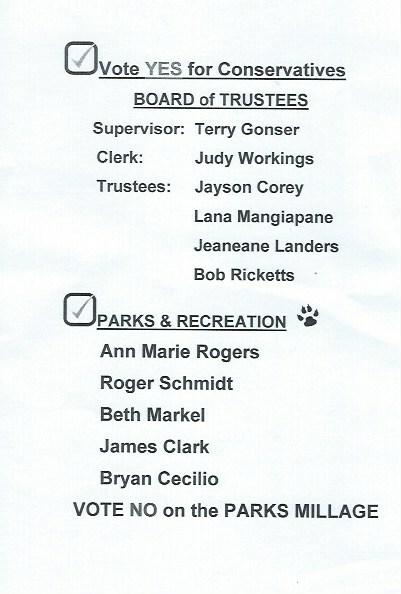 Residents voted to have an independently elected parks commission 40 years ago. I hope they continue to support the millage that keeps it going after all these years. Richard Michalski, how tasteless to put personal opinion on the township webpage. I am paying taxes for YOU to run a personal agenda here? Bud, I have no idea what you are talking about. This is not a Township website. It clearly states why this website was established. You are not paying anything supporting this effort. Unlike some of the Facebook pages that some of the current candidates have established that represent themselves as official Township sites, we have been above board, factual and honest on every post that we have made. Hope you have a good day!